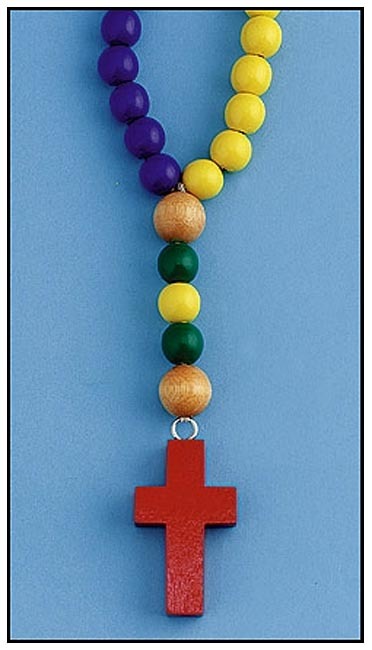 This Wooden Rosary for Children is the perfect way to introduce your children to the rosary at a young age. The large, multi-colored wood beads are strung on a durable cord and the bright red cross is securely attached with a metal ring. Each is made to withstand the wear and tear of a child. Also perfect for hanging on the wall of a child’s room to remind him or her that praying the rosary is an important part of their faith. Makes a great Baptism, birthday or Christmas gift for any Catholic child. 21 inches in length. Parts are considered non-toxic and lead free.